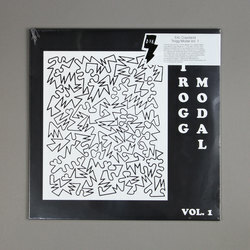 Eric Copeland - Trogg Modal, Vol. 1. Vinyl LP. Bleep. Eric Copeland comes through with his third DFA release in a little over a year. Trogg Modal, Vol. 1 is another salvo of zany club punk from the Black Dice-affiliated artist. Copeland’s sound straddles acid, electro, lo-fi electronics and just general oddness in a manner that places it (very) broadly in the minimal synth/post-punk lineage. However, the producer’s crashing anti-grooves and charity shop synth sounds make it easy to understand how he’s had a couple of drops on L.I.E.S.. Closer ‘Hugo’ even finds Copeland coming through with a slow-mo approximation of Balearic house. It’s weird and wonderful stuff made all the more charming by its complete lack of interest in charming you.